Latitude - Fully refundable ticket; Priority check-in; two complimentary checked bags; advance seat selection and access to Preferred Seats when available; complimentary Air Canada Bistro Voucher; same-day changes; 125 per cent Aeroplan Miles accrual; and Maple Leaf Lounge access for purchase. Comfort - Same-day standby (previously only available with Latitude); advance seat selection and access to Preferred Seats when available; complimentary alcoholic beverage; complimentary checked bag; early boarding; 115 per cent Aeroplan Miles accrual; and Maple Leaf Lounge access for purchase. Flex - Ticket changes permitted for a fee; advance seat selection; complimentary checked bag; 100 per cent Aeroplan Miles accrual; and Maple Leaf Lounge access for purchase. 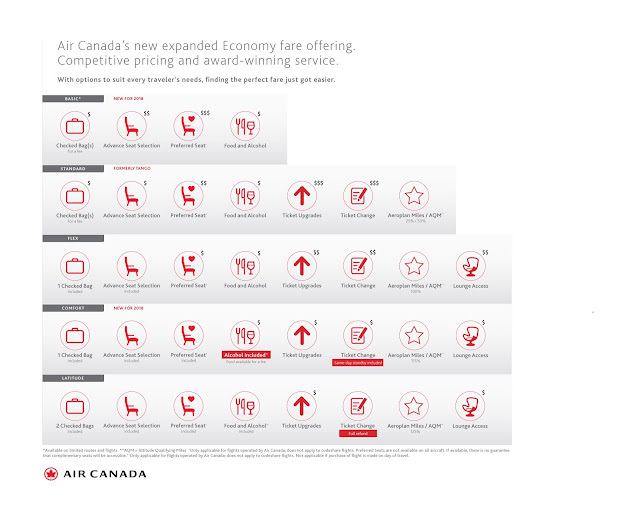 Standard - Ticket changes permitted for a fee; 50 per cent Aeroplan Miles accrual for transborder flights and 25 per cent Aeroplan Miles accrual for domestic flights. Basic - Air Canada's most restrictive fare option will be available only for select routes and flights and for booking exclusively through Air Canada channels. These low fares do not permit changes, are not eligible for upgrades, and do not earn Aeroplan Miles. Customers have the option to pay for checked bags, advance seat selection, and food and alcohol on board. Not too long ago we were asked when our 2018 Top Cash Back Credit Card rankings will be released and I mentioned they would come out in March like they did last year. However with so much happening in the cash back space right now with cards changing and new ones being introduced I have decided to hold back on releasing the Top list until we get all the details in of the cards. I anticipate that the rankings will come out sometime in May or June. Save up to 40% on Porter Airines flights to or from Stephenville. Use promo code Q0VZU3 for bookings made by April 22. Find out more here! Orbitz: Save 15% on hotel stays with promo code JUSTLIKETHAT. Book by April 22 for stays until Sep 30. Find out more here.